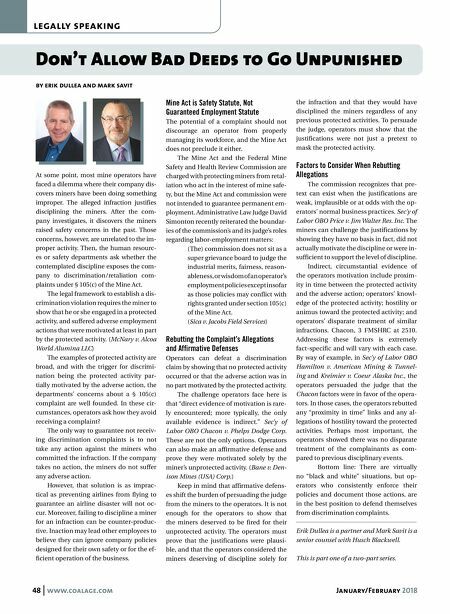 48 www.coalage.com January/February 2018 legally speaking Don't Allow Bad Deeds to Go Unpunished by erik dullea and mark savit At some point, most mine operators have faced a dilemma where their company dis- covers miners have been doing something improper. The alleged infraction justifies disciplining the miners. 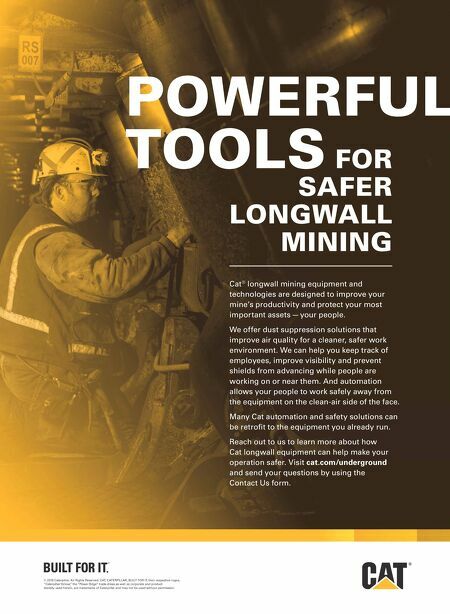 After the com- pany investigates, it discovers the miners raised safety concerns in the past. Those concerns, however, are unrelated to the im- proper activity. Then, the human resourc- es or safety departments ask whether the contemplated discipline exposes the com- pany to discrimination/retaliation com- plaints under § 105(c) of the Mine Act. The legal framework to establish a dis- crimination violation requires the miner to show that he or she engaged in a protected activity, and suffered adverse employment actions that were motivated at least in part by the protected activity. (McNary v. Alcoa World Alumina LLC) The examples of protected activity are broad, and with the trigger for discrimi- nation being the protected activity par- tially motivated by the adverse action, the departments' concerns about a § 105(c) complaint are well founded. In these cir- cumstances, operators ask how they avoid receiving a complaint? The only way to guarantee not receiv- ing discrimination complaints is to not take any action against the miners who committed the infraction. If the company takes no action, the miners do not suffer any adverse action. However, that solution is as imprac- tical as preventing airlines from flying to guarantee an airline disaster will not oc- cur. Moreover, failing to discipline a miner for an infraction can be counter-produc- tive. Inaction may lead other employees to believe they can ignore company policies designed for their own safety or for the ef- ficient operation of the business. Mine Act is Safety Statute, Not Guaranteed Employment Statute The potential of a complaint should not discourage an operator from properly managing its workforce, and the Mine Act does not preclude it either. The Mine Act and the Federal Mine Safety and Health Review Commission are charged with protecting miners from retal- iation who act in the interest of mine safe- ty, but the Mine Act and commission were not intended to guarantee permanent em- ployment. Administrative Law Judge David Simonton recently reiterated the boundar- ies of the commission's and its judge's roles regarding labor-employment matters: (The) commission does not sit as a super grievance board to judge the industrial merits, fairness, reason- ableness, or wisdom of an operator's employment policies except insofar as those policies may conflict with rights granted under section 105(c) of the Mine Act. (Sica v. Jacobs Field Services) Rebutting the Complaint's Allegations and Affirmative Defenses Operators can defeat a discrimination claim by showing that no protected activity occurred or that the adverse action was in no part motivated by the protected activity. The challenge operators face here is that "direct evidence of motivation is rare- ly encountered; more typically, the only available evidence is indirect." Sec'y of Labor OBO Chacon v. Phelps Dodge Corp. These are not the only options. Operators can also make an affirmative defense and prove they were motivated solely by the miner's unprotected activity. (Bane v. Den- ison Mines (USA) Corp.) Keep in mind that affirmative defens- es shift the burden of persuading the judge from the miners to the operators. It is not enough for the operators to show that the miners deserved to be fired for their unprotected activity. The operators must prove that the justifications were plausi- ble, and that the operators considered the miners deserving of discipline solely for the infraction and that they would have disciplined the miners regardless of any previous protected activities. To persuade the judge, operators must show that the justifications were not just a pretext to mask the protected activity. Factors to Consider When Rebutting Allegations The commission recognizes that pre- text can exist when the justifications are weak, implausible or at odds with the op- erators' normal business practices. Sec'y of Labor OBO Price v. Jim Walter Res. Inc. The miners can challenge the justifications by showing they have no basis in fact, did not actually motivate the discipline or were in- sufficient to support the level of discipline. Indirect, circumstantial evidence of the operators motivation include proxim- ity in time between the protected activity and the adverse action; operators' knowl- edge of the protected activity; hostility or animus toward the protected activity; and operators' disparate treatment of similar infractions. Chacon, 3 FMSHRC at 2510. Addressing these factors is extremely fact-specific and will vary with each case. By way of example, in Sec'y of Labor OBO Hamilton v. American Mining & Tunnel- ing and Kreimier v. Coeur Alaska Inc., the operators persuaded the judge that the Chacon factors were in favor of the opera- tors. In those cases, the operators rebutted any "proximity in time" links and any al- legations of hostility toward the protected activities. Perhaps most important, the operators showed there was no disparate treatment of the complainants as com- pared to previous disciplinary events. Bottom line: There are virtually no "black and white" situations, but op- erators who consistently enforce their policies and document those actions, are in the best position to defend themselves from discrimination complaints. Erik Dullea is a partner and Mark Savit is a senior counsel with Husch Blackwell. This is part one of a two-part series.